I needed this method to be able to return easily to the root of the menu. In my sketch I then imported and the Menubackend library and the LiquidCrystal library which is included in the Arduino IDE. The MenuBackend library allows to manage a very flexible menu. You can create the menu structure using such methods as addRight, addLeft, Add and AddBefore to add the entries to the right, left, below or above other menu items. To browse an item other intuitive methods are used such as moveLeft, MoveRight, moveUp and moveDown. In my example I created a structure like this. MenuBackend triggers an event whenever the current menu item changes and so I used to “print”on the LCD display the current menu item. In addition another event is triggered when an item is selected by the method “use”. This could be used to change the status of your application, but in this case I simply print to LCD the phrase “You used” followed by the name of the used menu item. To navigate the menus I used 4 buttons (Left, Right, Esc and Enter). Optionally, to facilitate connections you can use a card for prototypes (protoshield). I have used one from Nuelectronics. 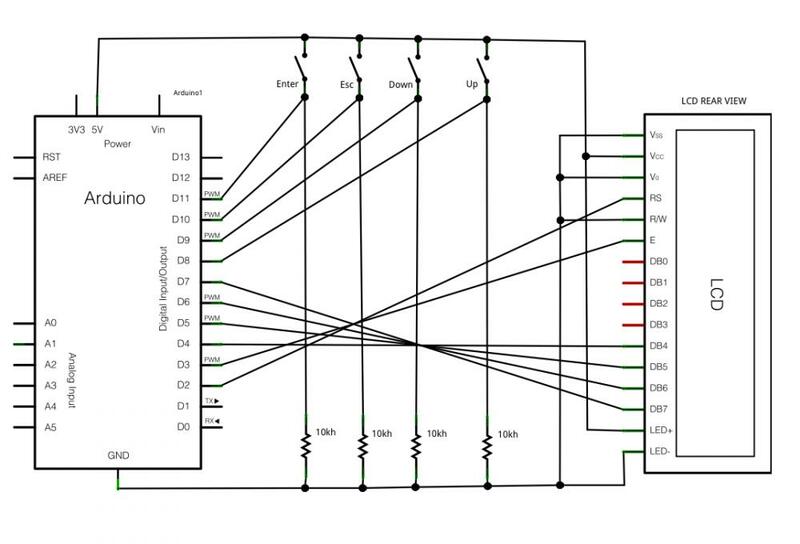 The schematic is very simple. 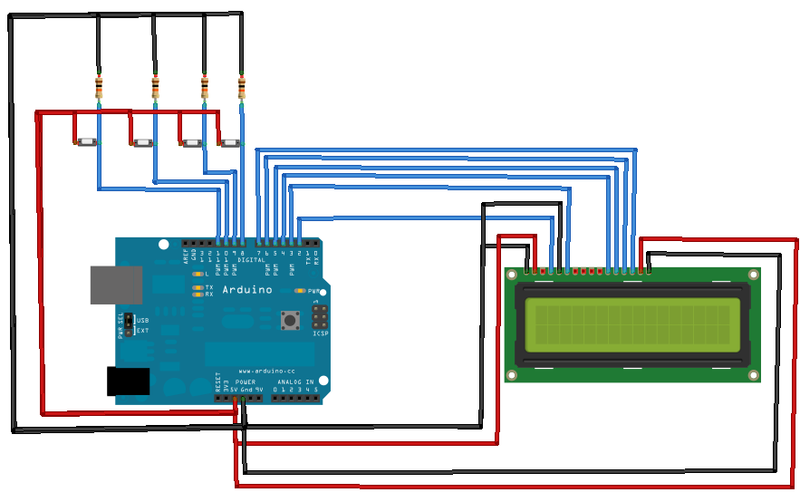 There are 12 of the 16-pin LCD display connected to the Arduino board: 6 are input pins, 2 power pins, 2are used to power the interior light ,1 to enable writing ( it is connected to ground )and 1 to adjust the contrast ( even is connected to the this ground to have always the maximum contrast). The 4 buttons are connected to four input pins of the Arduino, which also are connected to the ground through 10K resistors. The other end of the buttons is connected to the Arduino 5V. To connect the LCD display to the Arduino I first soldered two 6-pin strips male on the proto pcb and then, thanks to the an idea given to me by Emanuel in the comments of another post, I used an old parallel cable for IDE hard disks. Update: As noted by Liudr for safety reasons is better to use a very old 40 wires calble instead of the 80 wires cable used by me in these pictures. I think this type of structure although very simple may be useful in many situations to manage menu and LCD display with Arduino, and ican be used as a basis for other modifications.